Inventory We are a resale marketplace, not a box office or venue. Ticket prices may exceed face value. This site is not owned by Tennessee Theater Knoxville . The Tennessee Theatre is approaching nearly 100 years in existence as it was built in 1928. The Tennessee Theater box office is located on 604 South Gay Street in downtown Knoxville, TN. The theater now has a seating capacity of 1,631 after undergoing a major $29.3 million dollar renovation that was completed in 2005. 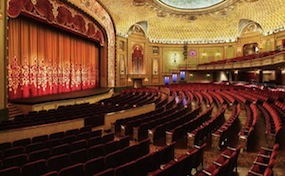 Tennessee Theatre tickets generally include traveling Broadway performances as well as touring concerts. Some of the productions that have played or are scheduled to perform at the Tennessee Theater include Camelot, Cinderella, Mamma Mia!, Avenue Q, Beauty and the Beast, and Hairspray. Concerts have also included acts like Bob Dylan, ZZ Top, The Avett Brothers, Bonnie Raitt, Leon Bridges, and Amos Lee. Tennessee.Theatre-Knoxville.com is an independently owned and operated company that specializes in all ticket sales in the secondary market. We are not currently affiliated with any primary venue, website, and or box office. Tickets may be above or below face value and prices will change with the market. To purchase your tickets to any Tennessee Theater Knoxville events simply pick up the phone and call our operators at anytime or follow the easy to navigate steps online.